As a business owner or marketer, you know the value of a video content marketing program for your business. But it isn’t always easy to implement. A successful program requires a well planned strategy to consistently deliver compelling content that your target audience wants. That takes time, skills, commitment and determination if you want to do it all yourself. The lack of motivation comes from their previous attempts that have failed to deliver the results that they had hoped. The good news is that you don’t need to do everything yourself. 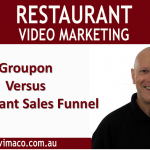 You can get help and outsource the parts of the video marketing that you lack such as time, tools or skills. The first thing you need to do is to fully document every step of the video marketing process before you hand it over to someone else to do. Essentially there are two levels of skills you can outsource; low skill level tasks that can be easily completed for a low cost and high skill level tasks that that can be better completed in less time. 1. Let’s say as a business owner, you earn $100 per hour working for clients as a consultant. A low skilled job such as transcribing a video may take two hours to complete. That means it will cost the business owner 2 x $100 = $200. If the business owner outsources the task for $20 per hour, it will cost $40, thus saving the owner $160. In this case, it makes sense to outsource this work. 2. In this example, the business owner takes 5 hours to create a motion graphic using After Effects for the video. That equates to 5 x $100 = $500. A motion graphic expert may charge $150 per hour (more than the business owner), but will complete the job in just 3 hours; 3 x $150= $450. The business owner not only saves $50 but has higher quality of work. There are 4 parts to a Video Content Marketing program. Now let’s look at each part in greater detail to see what we can outsource. You can start outsourcing a video marketing specialist that can outline a content program based on your key business objectives. This will include keyword research for what your target audience are searching for online, a playlist of all the videos required, a schedule content calendar and a distribution plan. Once the program has been designed for your business, you just need to implement it and analyse the results to ensure it’s working for you. Production includes all the things required before and during the video shoot. That means writing the outline or the script for the video and perhaps a storyboard for more complex shots. The video shoot can be outsourced with a production crew, talent, teleprompter, location, studio, art direction, props, wardrobe, make-up and catering. However for most business owners, a skilled videographer may suffice. You can make the production shoot more effective by scheduling a complete day and produce as many short videos as possible. For example, if you shoot eight videos in 8 hours, you will have enough content for the next two months. So you may only need to schedule six shooting dates a year. For most business owners, it is the video editing that causes the most angst due to the time it takes to complete. A three minute video may take three or more hours depending on the number of shots, colour correction, voice over, graphics, titles, music soundtrack and end cards. This can all be outsourced by sending all of your video footage to a post-production contractor via Dropbox. Its best to send them the video’s script and perhaps a sample video showing the style you would like to have for your video. When it comes time to review your video, be sure to give clear instructions for any changes required or they may start charging you for additional changes. This final stage of the video marketing program is to upload your video to your website / and social media platforms. The video’s title, description, tag words and thumbnail must be fully optimised to ensure it ranks high in Google for your keywords. You may also want to outsource someone to engage with your viewers by replying to comments in social media. Finally, the performance of your video needs to be fully analysed and tweaked to increase your Return On Investment. There are a great many websites where you can find contractors to help you with your video marketing program. The list below are some of the most popular sources that I have used, but like in the real world, there are some good contractors and some not so good, so always beware. When you post your job on one of the websites, clearly list details of tasks required for the job. Be sure to screen candidates by identifying the required level of skills and experience and always seek proof of work from their previous projects. When you do hire them, go through your step by step system that you documented so that they can complete the task exactly as you want it. Remember, sometimes it’s best to …”Let it Go”…(cue the song). There are many tutorials on how to use wordpress and it is easy to use. Good luck with your site. Famous! This is merely outstanding! Not simply top quality, however also valuable details. Which is unusual ahead by nowadays! I need to claim that I am really satisfied and also will surely return again if you keep up the top quality and value of the content at this degree, or even obtain it on the following level. Sincerely, from the bottom of my heart, thank you for your time! God bless!